Located just across the Potomac River from Washington, D.C., the county of Arlington blends big city and sprawling suburban environments. Your day-by-day itinerary now includes Tomb of the Unknowns. Kick off your visit on the 1st (Mon): get to know the fascinating history of Tomb of the Unknowns, steep yourself in history at Arlington National Cemetery, and then wander the streets of Old Town. Get ready for a full day of sightseeing on the next day: take in the history at Fredericksburg and Spotsylvania National Military Park, steep yourself in history at Chatham Manor, and then admire the striking features of George Washington's Mount Vernon. To see more things to do, maps, photos, and other tourist information, use the Arlington day trip site . Virginia Beach to Arlington is an approximately 3-hour flight. You can also do a combination of flight, bus, and subway; or drive. In July, daily temperatures in Arlington can reach 89°F, while at night they dip to 73°F. Finish your sightseeing early on the 3rd (Wed) to allow enough time to drive to Chincoteague Island. Famous for a wild breed of horses--Chincoteague Ponies--Chincoteague Island embraces the mystery of some of North America’s oldest inhabitants. To find more things to do and other tourist information, use the Chincoteague Island trip maker . Traveling by car from Arlington to Chincoteague Island takes 4 hours. Alternatively, you can do a combination of flight and bus; or do a combination of bus and taxi. Expect a daytime high around 86°F in July, and nighttime lows around 72°F. Cap off your sightseeing on the 3rd (Wed) early enough to go by car to Richmond. The capital city of Virginia, Richmond has diverse architecture, a large collection of monuments, and world-class museums that reveal the city's important role in American history. Your day-by-day itinerary now includes Virginia Museum of Fine Arts. On the 12th (Fri), explore the different monuments and memorials at Blandford Church and Cemetery, contemplate the long history of Pamplin Historical Park, and then admire the masterpieces at Virginia Museum of Fine Arts. On the next day, take in the architecture and atmosphere at St. John's Episcopal Church, get to know the fascinating history of Old Town, get engrossed in the history at Hugh Mercer Apothecary Shop, then contemplate the long history of Chatham Manor, and finally contemplate the long history of The Rising Sun Tavern. To find where to stay, more things to do, traveler tips, and tourist information, read Richmond trip builder site . You can fly from Miami Beach to Richmond in 6 hours. Other options are to do a combination of flight and bus; or drive. Traveling from Miami Beach in July, expect a bit cooler with lows of 71°F in Richmond. On the 14th (Sun), wrap the sightseeing up by early afternoon so you can travel back home. Located near the memorial park marking the site of one of the largest Civil War battles, the town of Gettysburg sits in a landscape of rolling green hills with views of the Blue Ridge Mountains in the distance. You've now added Gettysburg National Military Park to your itinerary. On the 13th (Thu), stroll the grounds of Gettysburg National Cemetery, take in the history at Monocacy National Battlefield, and then trek along Catoctin Mountain Park. On the next day, admire all the interesting features of Gettysburg National Military Park and then admire the architecture and history at Lincoln Statue at Wills House. To find other places to visit, traveler tips, and tourist information, you can read our Gettysburg itinerary maker website . You can drive from Chincoteague Island to Gettysburg in 5 hours. Alternatively, you can do a combination of taxi, bus, and flight; or do a combination of taxi, flight, train, and bus. In June, daily temperatures in Gettysburg can reach 81°F, while at night they dip to 62°F. On the 14th (Fri), wrap the sightseeing up by early afternoon so you can drive to Weston. Weston is a city in Lewis County, West Virginia, United States. Trans-Allegheny Lunatic Asylum has been added to your itinerary. Start off your visit on the 15th (Sat): shop like a local with West Virginia American Art Glass, then contemplate the long history of Trans-Allegheny Lunatic Asylum, and then do a tasting at Lambert's Vintage Wines. Get ready for a full day of sightseeing on the next day: steep yourself in history at John Henry Memorial Park and then identify plant and animal life at West Virginia State Wildlife Center. To see where to stay, maps, photos, and other tourist information, read our Weston tour itinerary maker app . You can drive from Gettysburg to Weston in 4.5 hours. Other options are to do a combination of taxi and bus; or do a combination of taxi, flight, and bus. In June in Weston, expect temperatures between 78°F during the day and 60°F at night. Finish up your sightseeing early on the 16th (Sun) so you can travel to Fancy Gap. Fancy Gap is a census-designated place (CDP) in Carroll County, Virginia, United States. Start off your visit on the 17th (Mon): see the interesting displays at The Mount Airy Visitors Center and then contemplate the long history of Mabry Mill. For traveler tips, other places to visit, reviews, and more tourist information, refer to the Fancy Gap route site . Getting from Weston to Fancy Gap by car takes about 4 hours. In June, plan for daily highs up to 78°F, and evening lows to 61°F. Wrap up your sightseeing by early afternoon on the 17th (Mon) to allow time for travel to Nags Head. A small resort town located in Georgia's "Historic High Country," Blue Ridge sits right on the national scenic trail that follows the Appalachian mountain range for over 3,300 km (2,100 mi). Kick off your visit on the 18th (Tue): do a tasting at Crane Creek Vineyards. On the next day, explore and take pictures at Mercier Orchards and then take a pleasant ride with a tour on horseback. To find reviews, where to stay, photos, and other tourist information, you can read our Blue Ridge planning tool . You can drive from Fancy Gap to Blue Ridge in 5 hours. Another option is to fly. When traveling from Fancy Gap in June, plan for a bit warmer days in Blue Ridge, with highs around 84°F, while nights are about the same with lows around 62°F. Finish your sightseeing early on the 19th (Wed) so you can travel to Nags Head. Most visitors take a trip to Nags Head to enjoy the beach, but this Outer Banks town offers more than just waterside entertainment. Your day-by-day itinerary now includes Historic Jamestowne. Kick off your visit on the 20th (Thu): contemplate the long history of Historic Jamestowne, enjoy the sea views from Currituck Beach Lighthouse and Museum, fly like a bird with a parasailing or paragliding tour, then steep yourself in history at Wright Brothers National Memorial, and finally have fun at Life on a Sandbar. Here are some ideas for day two: find your balance on the water with some of the best stand-up paddleboarding in the area, visit a coastal fixture at Roanoke Marshes Lighthouse, and then kick back and relax at Pea Island National Wildlife Refuge. To see reviews, traveler tips, more things to do, and more tourist information, read our Nags Head trip builder website . Traveling by combination of taxi, bus, flight, and car from Blue Ridge to Nags Head takes 7 hours. Alternatively, you can do a combination of car and flight; or drive. Expect a bit warmer evenings in Nags Head when traveling from Blue Ridge in June, with lows around 70°F. Wrap up your sightseeing on the 22nd (Sat) to allow time to drive to Hatteras Island. 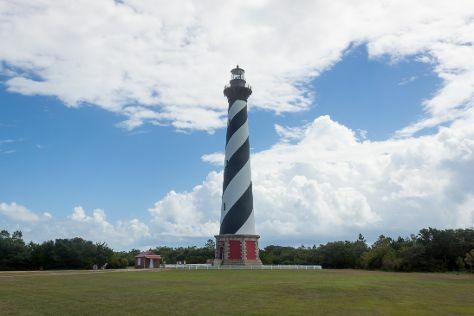 Kick off your visit on the 15th (Mon): steep yourself in history at Cape Hatteras Lighthouse, get a taste of the local shopping with Blue Pelican Gallery, then examine the collection at Hatteras Island Ocean Center, and finally kick back and relax at Haulover. For ratings, traveler tips, other places to visit, and tourist information, go to the Hatteras Island online attractions planner . You can drive from Nags Head to Hatteras Island in 1.5 hours. Expect a daytime high around 86°F in July, and nighttime lows around 75°F. Wrap up your sightseeing by early afternoon on the 16th (Tue) to allow enough time to drive to Wilmington. Holiday in Willington to discover a charming coastal city filled with azalea gardens, historical neighborhoods, and cozy cafes. On the 17th (Wed), stroll through Wrightsville Beach Municipal Complex, contemplate the long history of Airlie Gardens, and then examine the collection at Museum of the Bizarre. To find other places to visit, ratings, where to stay, and more tourist information, use the Wilmington trip itinerary planning website . Traveling by car from Hatteras Island to Wilmington takes 6 hours. Alternatively, you can do a combination of ferry and car. In July, plan for daily highs up to 89°F, and evening lows to 73°F. Wrap up your sightseeing on the 17th (Wed) to allow time to drive to Tybee Island. Tybee Island is a city and barrier island located in Chatham County, Georgia, 18 miles (29 km) east of Savannah, United States. Start off your visit on the 18th (Thu): stroll through North Beach, make a trip to Cockspur lighthouse, and then visit a coastal fixture at Tybee Island Lighthouse Museum. To find ratings, traveler tips, other places to visit, and other tourist information, go to the Tybee Island trip itinerary planner . Traveling by car from Wilmington to Tybee Island takes 6 hours. Alternatively, you can do a combination of flight and taxi; or fly. Expect a daytime high around 89°F in July, and nighttime lows around 75°F. Finish your sightseeing early on the 18th (Thu) to allow enough time to drive to Jekyll Island. A vacation on Jekyll Island allows visitors to discover the lifestyle of American aristocrats from the 19th century. Kick off your visit on the 19th (Fri): identify plant and animal life at Georgia Sea Turtle Center and then stroll through Driftwood Beach. For maps, other places to visit, where to stay, and tourist information, go to the Jekyll Island trip builder website . Drive from Tybee Island to Jekyll Island in 2.5 hours. Alternatively, you can take a bus. In July, plan for daily highs up to 90°F, and evening lows to 76°F. Finish up your sightseeing early on the 19th (Fri) so you can travel to Miami. Florida’s mecca of fun in the sun, the lively tropical metropolis of Miami is one of the world’s top vacation spots. On the 20th (Sat), examine the collection at Vizcaya Museum and Gardens, then contemplate the long history of Deering Estate, and then explore the world behind art at Perez Art Museum Miami. To find where to stay, other places to visit, maps, and tourist information, read our Miami travel planning site . Fly from Jekyll Island to Miami in 6.5 hours. Alternatively, you can drive; or do a combination of bus and flight. July in Miami sees daily highs of 91°F and lows of 78°F at night. 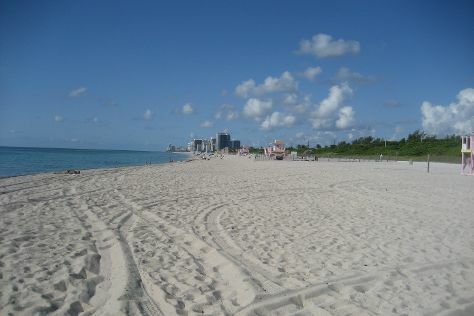 Finish your sightseeing early on the 20th (Sat) so you can drive to Miami Beach. You've now added Ocean Drive to your itinerary. Start off your visit on the 9th (Tue): enjoy the sand and surf at Haulover Beach Park, pause for some serene contemplation at Saint Francis de Sales Catholic Church, and then shop like a local with Ocean Drive. Here are some ideas for day two: discover the deep blue sea with a scuba or snorkeling tour, then get curious at Museum of Discovery and Science, and then view the masterpieces at Britto Central. To see where to stay, maps, traveler tips, and tourist information, go to the Miami Beach road trip app . Getting from Bentonville to Miami Beach by combination of taxi and flight takes about 7.5 hours. Other options: do a combination of car and flight; or drive. The time zone difference moving from Central Standard Time (CST) to Eastern Standard Time (EST) is 1 hour. Plan for a bit warmer nights when traveling from Bentonville in July since evenings lows in Miami Beach dip to 78°F. Wrap up your sightseeing by early afternoon on the 11th (Thu) to allow enough time to travel back home. Located just 140 km (90 mi) from Cuba, Key West is an island only about 6.4 km (4 mi) long and 1.6 km (1 mi) wide. You've now added Dry Tortugas National Park to your itinerary. You'll explore and learn at The Ernest Hemingway Home and Museum and Mel Fisher Maritime Heritage Museum. Eschew the tourist crowds and head to Kayaking & Canoeing and U.S. Coast Guard Cutter Ingham Maritime Museum. The adventure continues: glide peacefully along the water with some of the best stand-up paddleboarding in the area, fly like a bird with a parasailing or paragliding tour, relax and rejuvenate at some of the top local wellness centers, and explore the different monuments and memorials at Key West Cemetery. For more things to do, traveler tips, reviews, and tourist information, go to the Key West trip planner. You can fly from Miami to Key West in 2.5 hours. Alternatively, you can do a combination of bus and flight; or drive. In June, daytime highs in Key West are 88°F, while nighttime lows are 79°F. Finish up your sightseeing early on the 1st (Mon) so you can travel to New Orleans. Known for its Creole cuisine, rich musical tradition, and nearby swamps and plantations, New Orleans is one of the nation's oldest cities. On the 27th (Sat), look for all kinds of wild species at Jean Lafitte National Historical Park and Preserve. Keep things going the next day: take in the spiritual surroundings of St. Louis Cathedral, stop by Faulkner House Books, then examine the collection at The National WWII Museum, and finally take a stroll through Garden District. To see reviews, ratings, more things to do, and other tourist information, read New Orleans online road trip planner . Getting from Key West to New Orleans by flight takes about 6.5 hours. Other options: do a combination of shuttle and flight; or drive. Due to the time zone difference, you'll gain 1 hour traveling from Key West to New Orleans. When traveling from Key West in July, plan for little chillier days in New Orleans, with highs around 80°F, while nights are about the same with lows around 80°F. Finish up your sightseeing early on the 28th (Sun) so you can go by car to Vicksburg. Vicksburg is the only city and county seat of Warren County, Mississippi, United States. Kick off your visit on the 29th (Mon): explore the galleries of U.S.S. Cairo Museum, then examine the collection at The Old Depot Museum, then examine the collection at Jesse Brent Lower Mississippi River Museum and Interpretive Center, and finally steep yourself in history at Anchuca Mansion. On the 30th (Tue), you'll have a packed day of sightseeing: take a peaceful walk through Mississippi Petrified Forest, then take in the history at Vicksburg National Military Park, and then take an in-depth tour of Southern Heritage Air Foundation. For reviews, where to stay, traveler tips, and more tourist information, use the Vicksburg trip planner . You can drive from New Orleans to Vicksburg in 4 hours. Other options are to do a combination of train and car; or fly. Traveling from New Orleans in July, expect nights in Vicksburg to be little chillier, around 72°F, while days are a bit warmer, around 91°F. Cap off your sightseeing on the 30th (Tue) early enough to go by car back home. Situated at the foothills of the Blue Ridge Mountains, Charlottesville is perhaps best known as the home of three of the United States' founding fathers, including Thomas Jefferson. Your day-by-day itinerary now includes Thomas Jefferson's Monticello. On the 31st (Wed), make a trip to Dean Cemetery, take in the awesome beauty at Bearfence Mountain, then take in the exciting artwork at C'ville Arts, and finally browse the exhibits of Thomas Jefferson's Monticello. Get ready for a full day of sightseeing on the next day: hike along Luray Hawksbill Greenway and then get interesting insight from Tours. To plan Charlottesville vacation without wasting time, ask Inspirock to design an itinerary. You can fly from Vicksburg to Charlottesville in 5.5 hours. Alternatively, you can do a combination of car and flight; or drive. The time zone changes from Central Standard Time to Eastern Standard Time, which is usually a 1 hour difference. In July in Charlottesville, expect temperatures between 88°F during the day and 68°F at night. Wrap up your sightseeing by early afternoon on the 2nd (Fri) to allow enough time to travel back home.